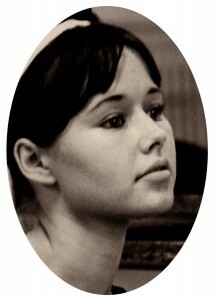 This is me at 17 (1965). It was taken by a photographer at the ballet school where I studied (and taught on Saturdays to pay for my own classes). When I was a kid, back in the 1950s-60s, my parents took a few photos–but only on important occasions, like Christmas, summer vacation, First Communion and Confirmation. 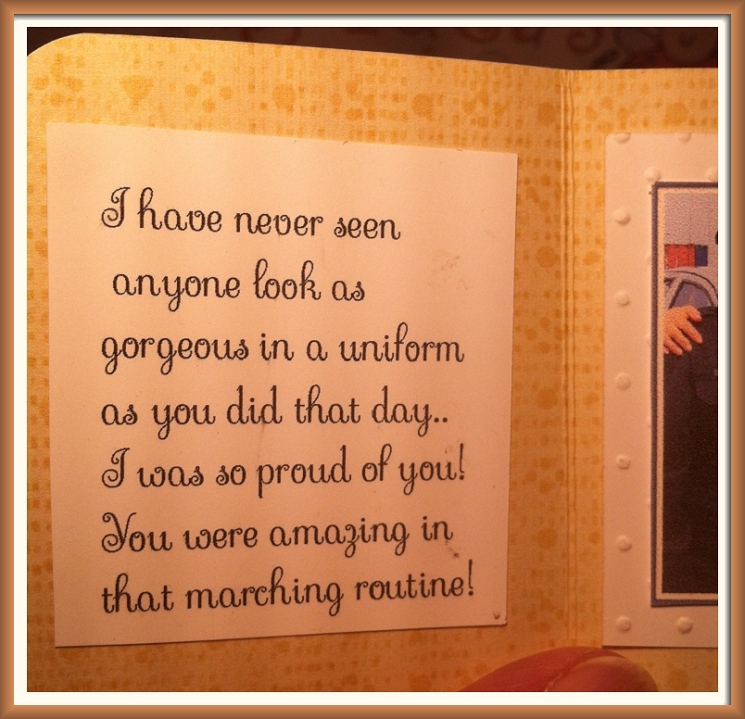 Eventually, my mom would get them developed, show them to us once and then hide them away in a deep, dark closet. Oh, how that frustrated me. I mean, come on, photos are for looking at and enjoying!! I’m now 64 years old, and just three years ago I managed to get those photos from her (she was actually glad to get them out of her closet). What a treasure box of memories. 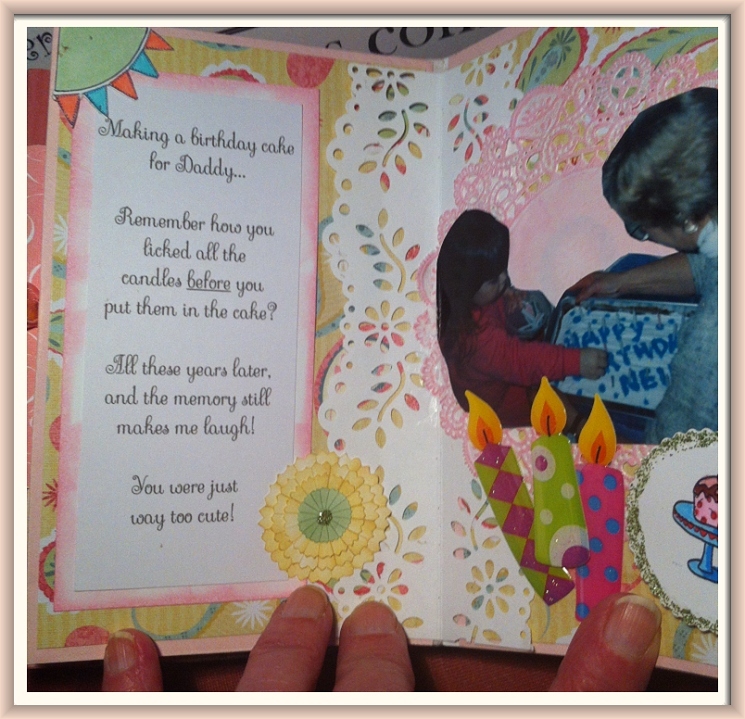 The idea of making a huge scrapbook sometimes feels like an onerous task, but mini-albums, or vignettes of your life, as I like to call them, are (in my opinion) easier and more fun to create. Also, I like the idea of focusing on one topic at a time. I’ve never made a scrapbook about myself, but I’m thinking that it might be nice to leave one behind for my kids to enjoy after I’m gone…which won’t be for a very long time, I hope! 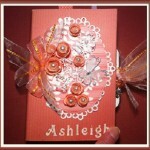 Over the past year, I have made several mini-albums for my family. (They serve as both a card and a gift!) 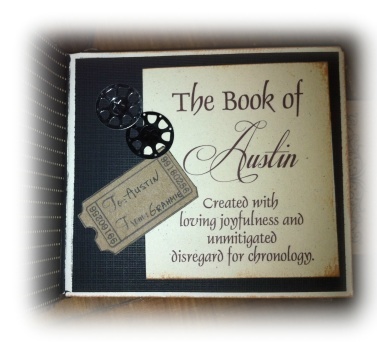 For my grandson’s 18th birthday, I made The book of Austin, an envelope mini-album that focused on his many talents. Click on the photo to see a video of the album in its entirety. 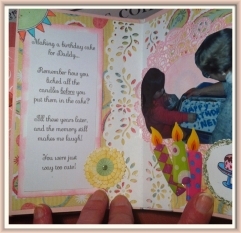 When my granddaughter, Lindsay, turned 21, I made one that was sweet and pink and girly, just like she is. I made this one from toilet tissue tubes. It was my first one, and I really had fun with it! Click on the photo to see a video of the album in its entirety. The next one was for my granddaughter, Ashleigh, who also celebrated her 18th birthday this year. 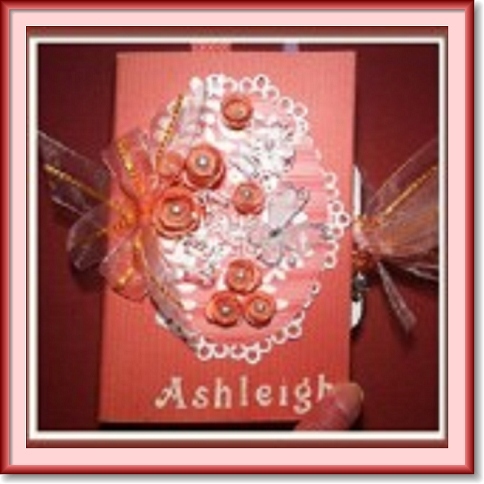 Ashleigh’s album was a flashback of her life from birth to 18. It was so much fun looking through her photos! I had to enlarge this photo of the cover and, in doing so, I lost some of the photo quality. Click on the photo to see a video of the album in its entirety. By the way, I have thousands and thousands of photos, both printed and digital. I keep the printed ones in photo boxes, filed by each person’s name. 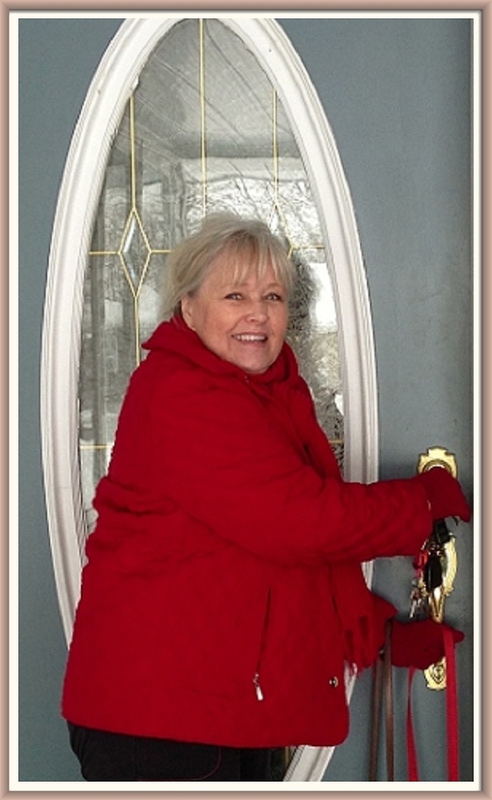 So, for example, when I want a photo of my mom, I just got to the “MOM” tab and there they all are. I also keep a tab for group shots. This filing system makes selecting photos for a project so easy. 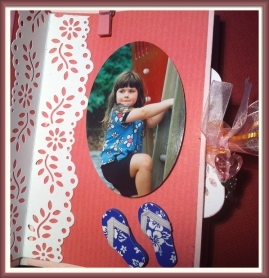 As for the digital photos, I create digital file folder for each year and file the photos as follows; BIRTHDAY-Angie 45th; BIRTHDAY–Ashleigh 18th; BIRTHDAY–Mom–82nd; VACATION 2012…and so on. My latest mini-album is of my nephew, Eric and his new bride, AnnMarie. I’m going to post it, shortly! 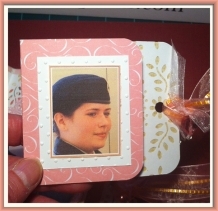 Make one soon for someone you love–why not for Christmas! It doesn’t have to be huge, just six or more pages. 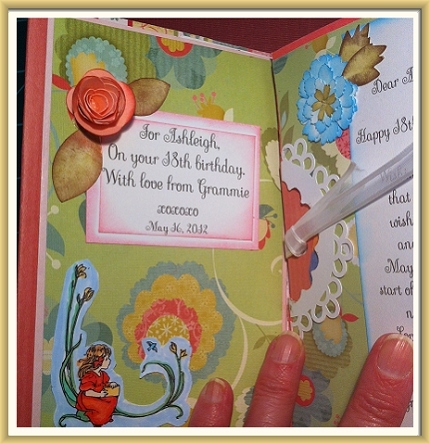 I promise you it will be a treasured gift and a lot of fun to make and give. P.S. 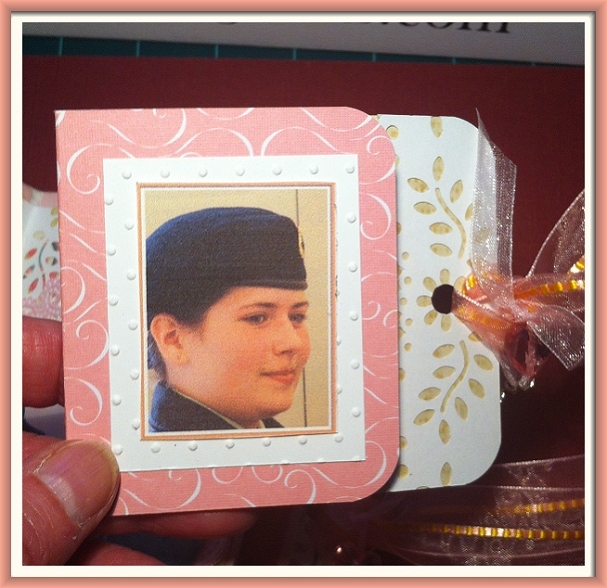 In the making of my mini-albums, in addition to photos of each person, I also included inspirational thoughts and messages, digital art that I coloured with my Copic markers, metal charms, ribbon, shiny beads and other bling, as appropriate. 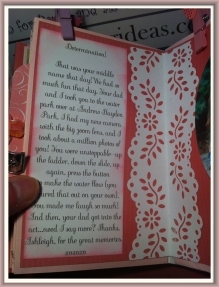 Oh, My Goodness, Ashleigh’s Eighteen! My granddaughter, Ashleigh, celebrated her 18th birthday last week. I wanted to give her something special to mark the occasion, so I made this envelope mini-album, filled with photos and special messages from me (Grammie) to her. 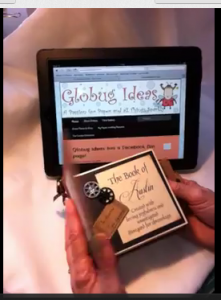 To see my video, which shows each and every page and tag, please visit my YouTube channel, Globug2005. Following below, are some photos with brief descriptions. I hope this mini-album inspires you to create one for someone you love. Sometimes it’s hard to get started, but once you do, I promise you will enjoy every minute you spend creating your special gift. 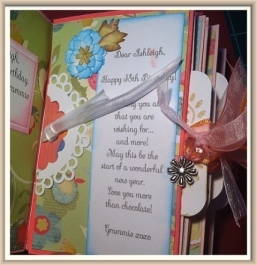 Just as a note, all of the flowers were created with my Silhouette Cameo. 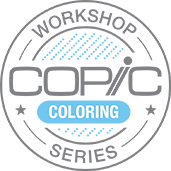 I coloured them by rubbing ink pads right over them (I also coloured my thumb in a variety of pastel shades 🙂 On a few of the leaves, I used my Cuttlebug to add texture and then ran the ink pad over the surface to add colour. Here is the cover. 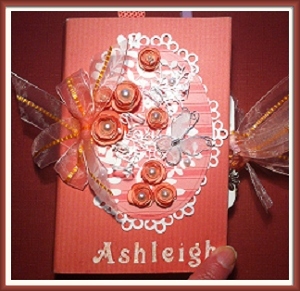 All of the paper embellishments on the cover were made on my Silhouette Cameo–doilies, roses, branches and vines. I also created her name with the Cameo. I added some matching ribbon for an even more feminine look. Here is a close-up showing some of the Silhouette Cameo die-cuts and roses. 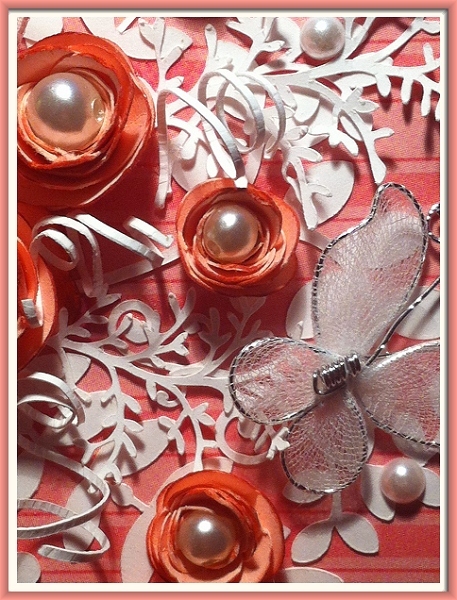 I added a pearl in the centre of each one and a pretty butterfly from my stash. 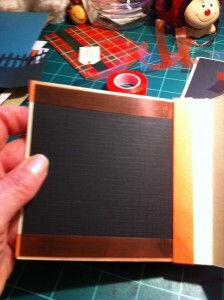 The photos below show the inside cover and page one, which opens up to reveal two secret pages. 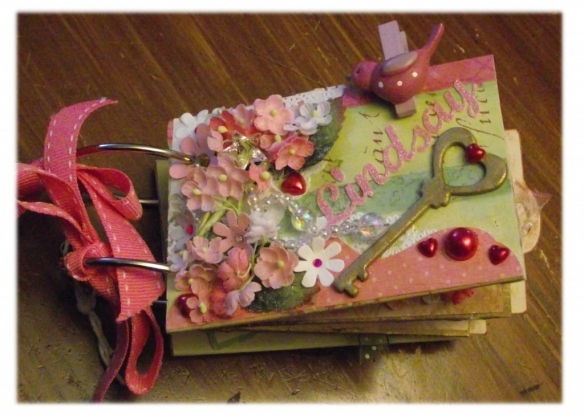 The ribbon, which serves as a handle to pull open the page, is attached to a pink tag that fits into the pocket. The tag is a little money holder. 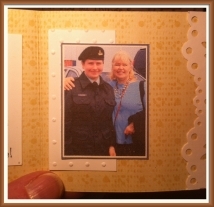 Ashleigh at her Army Cadet end-of-year ceremonies. That’s me with Ashleigh. 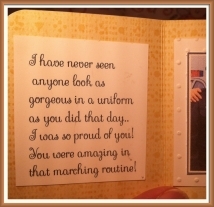 I was a very proud Grammie! Hi, folks! Tonight’s post is all about an envelope mini-album that I made for my grandson, Austin’s, 18th birthday in January. I posted a video on my YouTube channel, so you might want to have a look there, too. What follows below are photos of each step, along with a few words of explanation. I was glad to finally find a use for a stack of business envelopes that I’ve had since the pre-e-mail days. 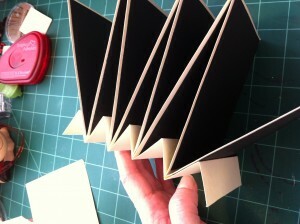 I started by folding them in half, to create the pages and pockets that will be formed when I glued the edges together. 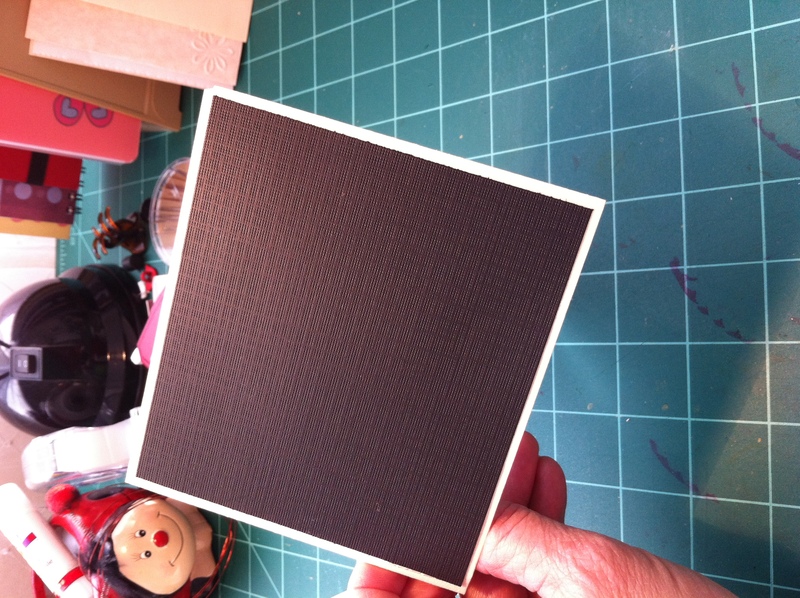 Next, I covered the two halves of the front side of the envelope with black card stock. I chose black because it worked well with my theme. 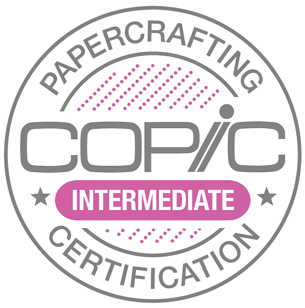 You may choose whatever paper suits your theme. I continued this way until I had a total of five envelopes. These would be the pages of my mini-album. 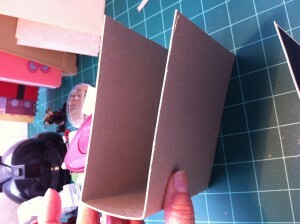 This photo shows the binding for my mini-album. 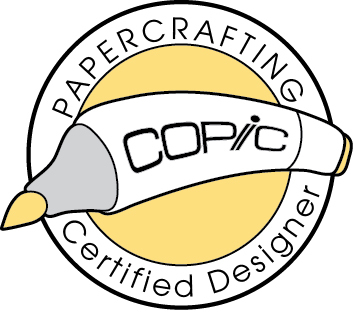 It is simply a strip of cardstock, scored at one-inch intervals. 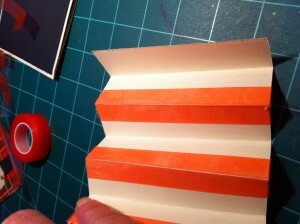 I then folded the cardstock accordion-style on the scored lines. Next, I put strips of heavy-duty tape on the peaks of each fold (one strip on each side of the peak, as seen in the photo). This is what holds the pages solidly in the mini-album. 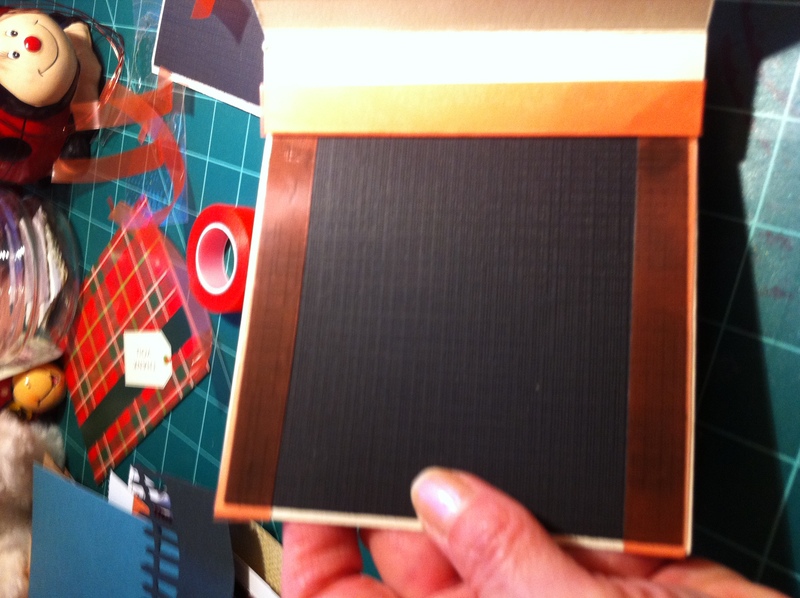 By taping just at the peaks, it allows the binding to expand so that the pages can open fully. For the cover, I used a piece of heavier cardstock–just a piece I had saved from a 12″x12″ stack of designer paper. I never throw anything away that might come in handy for albums and other paper crafts. 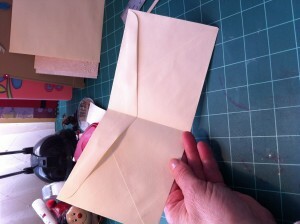 I cut the card stock to fit the size of my folded envelopes, being sure to add enough for the spine. It is important to make the spine fairly wide–mine is about two inches–because once you add all the embellishments to your pages, you will need plenty of room for expansion. 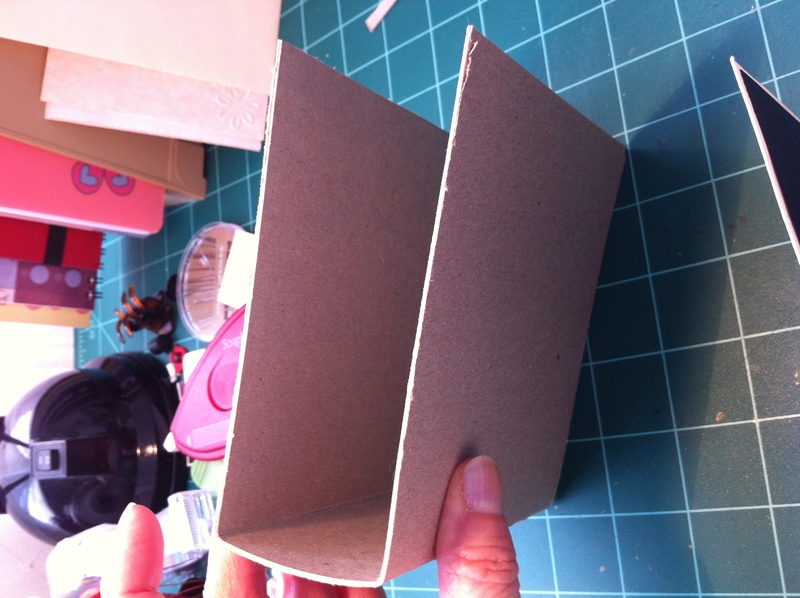 Covering the outside and the inside of your book cover is fun, because this is where the creative part begins. 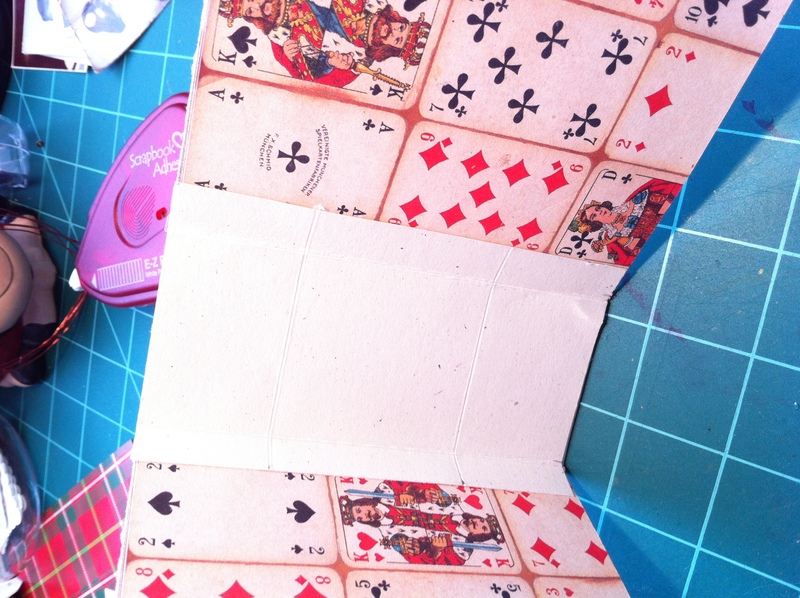 I lined the inside of my cover with this playing card paper because my grandson is a talented magician. However, after I got the book assembled, I decided I wanted a different look. If you watch my video you will see the final look. I covered the outside of my mini-album with a masculine brown patterned designer paper, which you can sort of see in this photo. Unfortunately, got so involved with the project, that I kept forgetting to take photos at every point along the way. 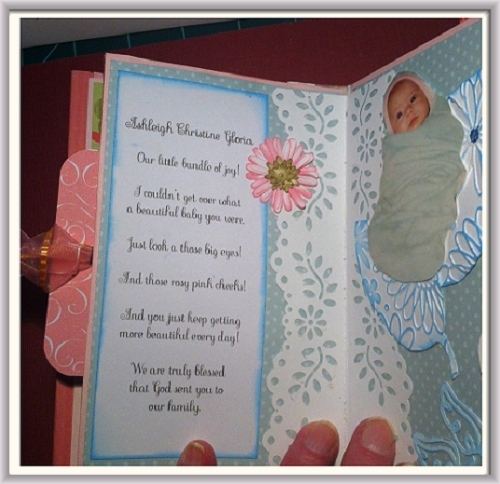 I was able to do screen-grabs of the cover and the first page from my YouTube video. You will see them much better in my YouTube video. To the left is the front cover. It’s a play on words…Austin’s working name is Auzztino the Great (he works at birthday parties, parades, grand openings and other special events as a clown. He rides a unicycle, juggles, balances everything from chairs to 10-ladders on his chin, makes the best balloon animals and does amazing magic tricks!) 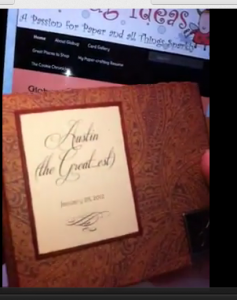 Anyway, I called the mini-album “Austin the Great…est.” And he is! 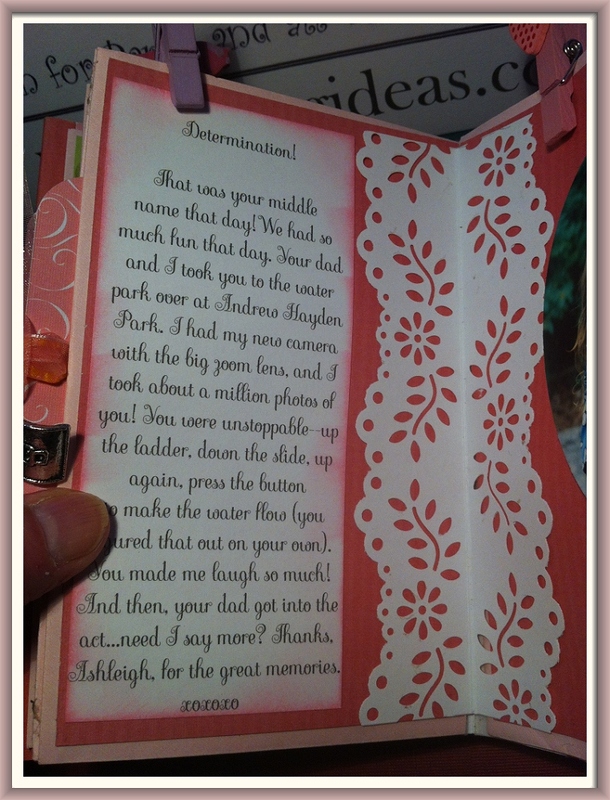 Here is the first page. I used a film/theatre theme because he is also an avid film-maker. He writes the scripts, makes professional-looking props, directs, acts, does unbelievable special effects make-up, films, edits, lays the sound tracks and…well, you get the idea! I’m just a wee bit proud of this amazing young man. Okay, so here is that first page I mentioned all so long ago! So written because I couldn’t decide in which order to put the pages! Although this post is not very detailed in describing the steps I took to create my mini-album, I hope that it helps you a little and inspires you a lot! Please come back and share your mini-album with us.